Tens of thousands of people are expected in Manchester to mark the centenary of the Battle of the Somme. A parade featuring military personnel and descendants of those who fought at the Somme will leave Albert Square at 2pm, continuing along John Dalton Street and Deansgate to finish at Manchester Cathedral, where a service of remembrance will be held at 3pm. Colour Sergeant Lee Vout and Major Andy Holsgrove told us about their relatives who fought in the Battle of Somme. 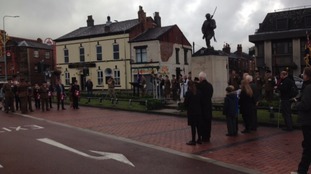 Transport for Greater Manchester joined City Council and Network Rail as the country marks the centenary of the Battle of the Somme. In the lead up to the Centenary of The Battle of the Somme, a Granada Reports viewer got in touch to tell us her grandfather's story. Somme Thiepval: A century to the day after the bloodiest battle in our history, event in France marks 100 years since the Somme. 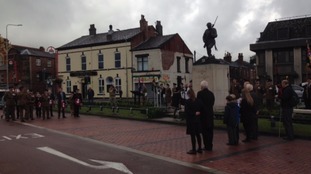 An event is being co-ordinated by the Chorley Pals memorial Trust to remember those who made the ultimate sacrifice at the Battle of Somme. The 100th anniversary is an important date in our borough’s history because so many residents put their lives at risk in what was one of the bloodiest battles in the history of the British Army. 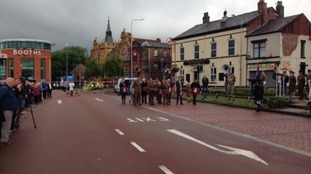 It’s quite right that we pay our respects and having the 3 Medical Regiment march through the town is a fitting way to recognise the sacrifices that people made. The nation has fallen silent to honour the thousands of soldiers who died in the Battle of the Somme 100 years ago. The battle was the bloodiest day in British military history, with 60,000 soldiers killed on the first day alone. Ceremonies were held across the country, with a two-minute silence ending at 7.30am - the time when British, Commonwealth and French forces went 'over the top' in northern France. In London, people lined Parliament Square to pay tribute, with the King's Troop Royal Horse Artillery manning three guns which were fired every four seconds for 100 seconds to mark the silence. The battle lasted for 141 days. Services are underway in Lochnegar to commemorate the battle of the Somme which began 100 years ago. The area is well-known for a 300ft crater formed by an allied explosion during the battle. Lochnagar Crater is now a peace memorial dedicated to "fellowship and reconciliation" between all nations who fought on the Western Front. Pastor John Pressdee said: "Help us remember our common humanity, and as we celebrate the young lives who died in the pursuit of peace, help us to apply the lessons and to learn the lessons of history so that we would never have to travel that road again." Imperial War Museum North made their own commemoration of the Somme Centenary. The building was lit up from 10pm on 30 June until dawn on 1 July to remember the thousands of men who would have been preparing for the first day of the battle, 100 years ago. A brother and sister from the Isle of Man have made an emotional trip to France to remember relatives who fought at the Somme. Speaking before they left Linda Stricket and David Brew said they felt humble to be making the journey.